HOUSTON – (Jan. 31, 2018) – Houston Methodist researchers have a new explanation for what causes the lungs' airways to close during asthma attacks that could change the lives of the 300 million people worldwide who suffer from asthma. The discovery holds promise for developing a new class of drugs that is radically different from the steroids currently used to treat it. 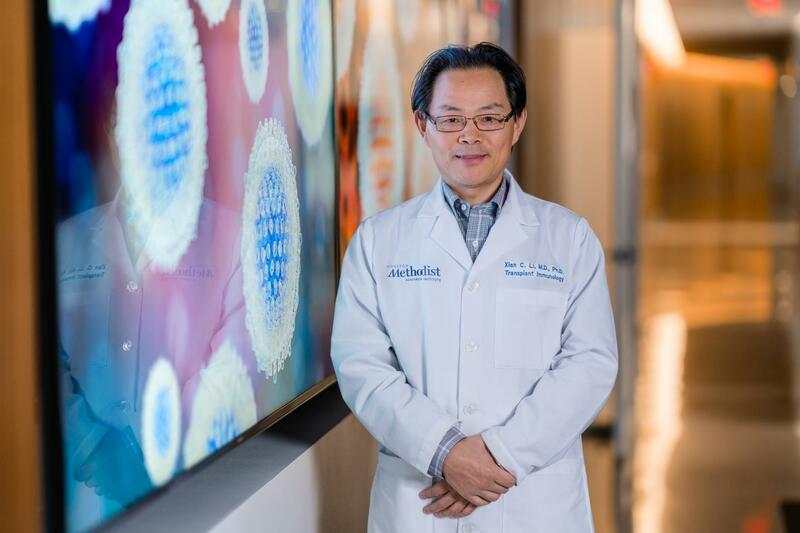 Led by Xian C. Li, M.D., Ph.D., and his colleagues in the Immunobiology and Transplant Science Center at the Houston Methodist Research Institute, the study is in the Feb. 5 issue of the Journal of Experimental Medicine, one of the oldest journals in medicine. One of the key features of asthma is an overproduction of a highly sticky protein secreted by the mucous membranes of airways in the lungs, called mucin, which leads to plugging up the small airways and stopping air from traveling in and out of them. This leaves patients out of breath and, oftentimes, causes them to gasp for air. Li and his team discovered an interaction between two molecules that can be manipulated to solve this problem. "If we can do this and develop better and more specific drugs to selectively stop super-enhancers, asthmatic patients may never have to struggle for air again," he said. Li explained that the inner lining of the elaborate lung airways is made up of epithelial cells that allow air to travel in and out, and this inner lining keeps the airways open. "Embedded in these epithelial cells are a very important cell type called mucin-producing cells that are vital for keeping the epithelial surface moisturized and healthy, and they secrete mucin to protect the surface of the airways. Production of mucin is normally tightly controlled, but too much of it can be damaging," he said. Central to their findings was the identification of T helper cells that communicate with mucin-producing cells in the lungs through a small protein called interleukin 9 (IL-9). These T helper cells are a specialized type of white blood cells responsible for helping other cells in the immune system recognize foreign toxins by secreting IL-9 to regulate immune responses. In asthma, the T helper cells in the lungs are hyperactive and express a molecule called OX40. To help immune cells survive, OX40 organizes super-enhancers, which are regions of DNA that control what genes become active, causing T helper cells to produce an abundance of IL-9. This, in turn, leads to massive production of mucin in the airways, eventually clogging them up. "We were able to decipher how such great quantities of IL-9 are produced by T helper cells," Li said. "In essence, OX40 activates the IL-9 gene in T helper cells, leading to the overproduction of IL-9 through a powerful molecular machinery of super-enhancers that regulate gene expression." Using chemical inhibitors, Li and his colleagues found a new way to stop this assembly of IL-9 gene super-enhancers to prevent the production of IL-9. This may point to new ways of treating asthma. "Finding new approaches to target and block super-enhancers may provide a new means of treatment for asthma patients that is likely to be more efficacious than the standard of care, which is now steroids," Li said. Other researchers collaborating on this paper with Li were fellow Center for Immunobiology and Transplant Science colleagues Xiang Xiao, Yihui Fan, Junhui Li, Xiaolong Zhang, Xiaohua Lou, Yaling Dou, Xiaomin Shi, Peixiang Lan, Yue Xiao and Laurie Minze. The study was funded by two National Institutes of Health R01 grants (R01AI129906 and R01AI106200). To speak with Xian C. Li, Ph.D., contact Lisa Merkl, Houston Methodist, at 281-620-2502 or [email protected] For more information about Houston Methodist, visit houstonmethodist.org. Follow us on Twitter and Facebook. For more information: Guidance of super-enhancers in regulation of IL-9 induction and airway inflammation. Journal of Experimental Medicine DOI: http://dx.doi.org/10.1084/jem.20170928 (Feb. 5, 2018) X. Xiao, Y. Fan, J. Li, X. Zhang, X. Lou, Y. Dou, X. Shi, P. Lan, Y. Xiao, L. Minze and X.C. Li.